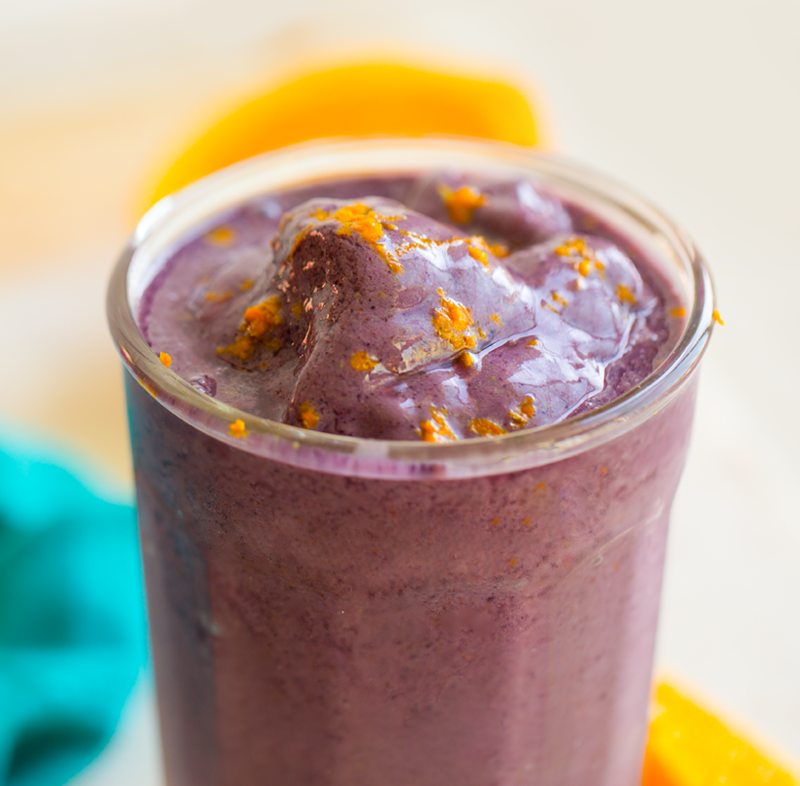 Since this week's Meal Plan is all about smoothies and salads, I wanted to share a favorite smoothie that I have been making lately. 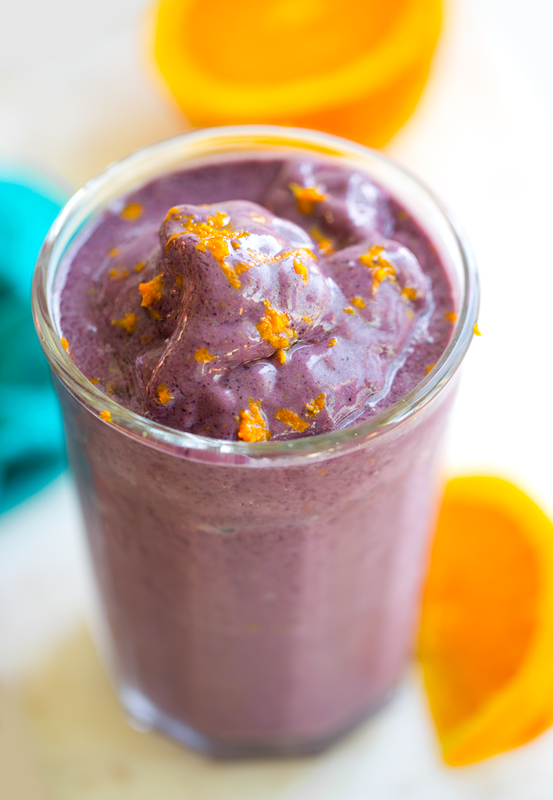 This Purple-Citrus Strawberry Banana Smoothie is an upgraded version of a classic banana-strawberry smoothie. I add in some blueberries for bonus antioxidants and a pretty purple color. And the real secret ingredient is the orange citrus zest! It adds such a bright accent of flavor. This blend is sweet, vibrant and summery. 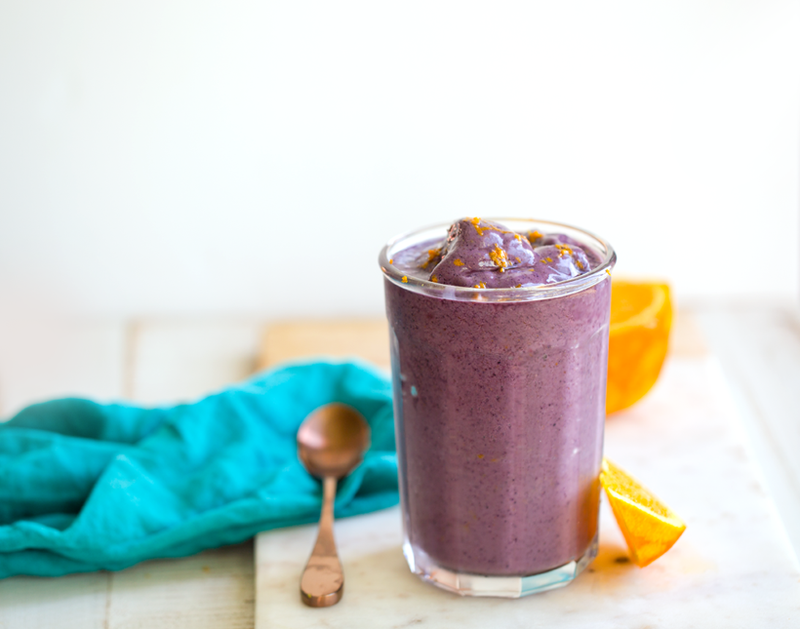 I have been making this as a late afternoon post-workout smoothie. Give it a spin, also I share a documentary I recently loved..
Orange Citrus Zest. Citrus zest is one of my favorite add-in ingredients - from smoothies to cookies or muffins - a little citrus zest goes a long way in a recipe. Citrus is such an uplifting aroma - I get a little energy boost just from the zesting process! Instant aromatherapy. 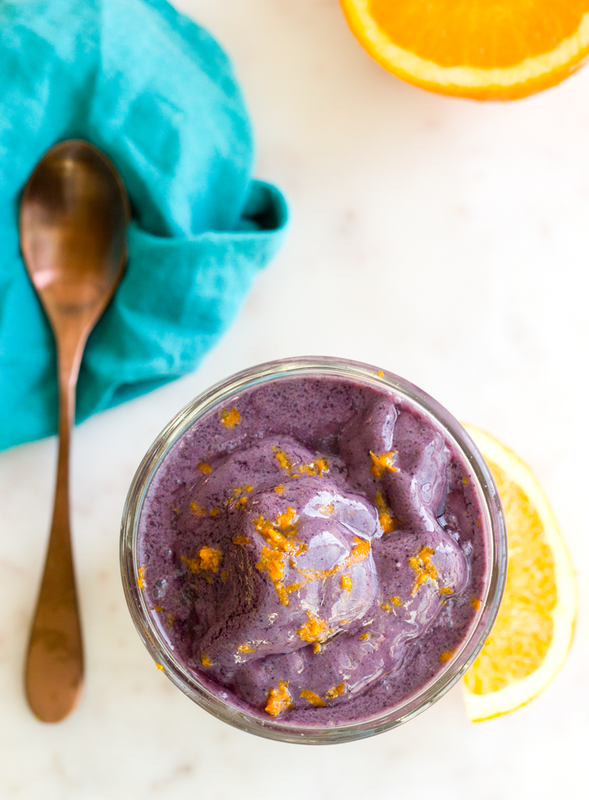 Some of my favorite smoothies in my book 365 Vegan Smoothies include citrus. You can snag a copy for under $12, last time I checked, on Amazon! And if you already own a copy, I would be so grateful if you took a minute to give it a review on Amazon. Protein Add-in. For today's smoothie, I loved adding my friend Sophie's protein powder, Berry Bliss. 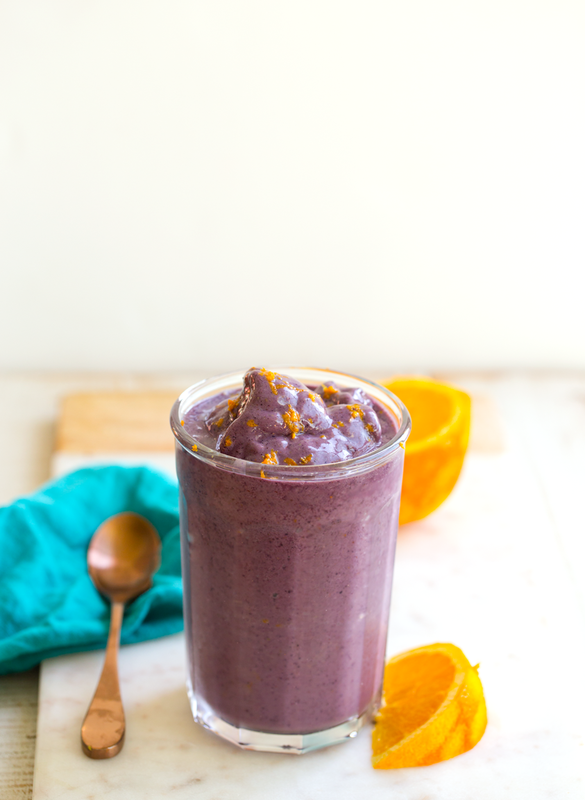 It adds protein, vitamin C, and antioxidants from pomegranate, goji and acai and has a nice berry flavor. If you don't have Philosophie, you could try another protein or superfood powder that is either berry or natural/original in flavor. I chat about my favorite vegan protein powders in this Big Protein Powder Review. Or you could add in a spoonful of hemp seeds or simply omit the added protein part. I do not always add protein to my smoothies. I usually only do it when the smoothie is acting as a meal replacement or I am really hungry and need a hunger-sustaining smoothie, or sometimes for an after-workout smoothie. Some people think adding protein to your smoothies means adding two giant scoops of it, I usually only add a little bit, just to even out the nutrients a bit too. 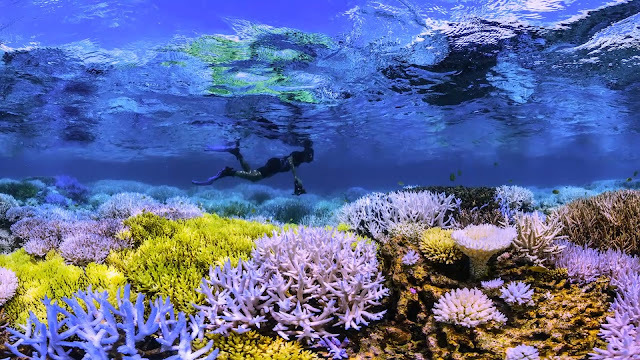 I recently watched the documentary Chasing Coral, available on Netflix. I randomly turned it on expecting to watch ten minutes at most, but then I couldn't turn it off. It was heartbreaking and depressing, but also fascinating. I became teary eyed a few times towards the end as they showed the coral bleaching process and the toll climate change is taking on the magical worlds under the sea. Worlds that humans glorify and are inspired-by in fantasy movies like Finding Nemo and The Little Mermaid. But the crazy part is that those magical, rainbow-colored, vibrant, life-filled worlds DO exist in real life, but they are swiftly dying. And though coral bleaching has been happening for many years, this is the worst that ocean scientists have ever seen. The film was excellent, but I feel it fell short in the "call to action" part of the film. I wish the film talked about how changing your lifestyle or diet can really impact the planet in a positive way. Or especially how animal agriculture is responsible for a very large chunk of climate change. I watched all the scientists at the end, watching the finished time-lapse project and I wondered how many of them were leaning towards vegan. Documentaries like Before the Flood and Cowspiracy really bring to light the facts about animal agriculture and our planet. Coral bleaching is beyond sad, and I hope it doesn't wipe out all the beautiful, life-infused reefs. "But will the reefs heal themselves naturally, in time?" That is the big question that keeps spinning in my mind, the skeptical viewpoint. And there is no answer, but all we can look at is what we see happening, and it isn't good when whole ecosystems are collapsing right before our eyes. - "93% of heat trapped in the earth’s atmosphere is absorbed by the ocean. Without our oceans, the average air temperature would be 122 degrees Fahrenheit." - "Coral reef ecosystems support 25% of marine life in our ocean." - "A temperature increase of just 2 degrees Celsius may not seem like a lot in the air, but for marine life this is like living with a constant fever." So if you get a chance, check out the film and let me know how you felt watching it. I was surprised how moved I was. 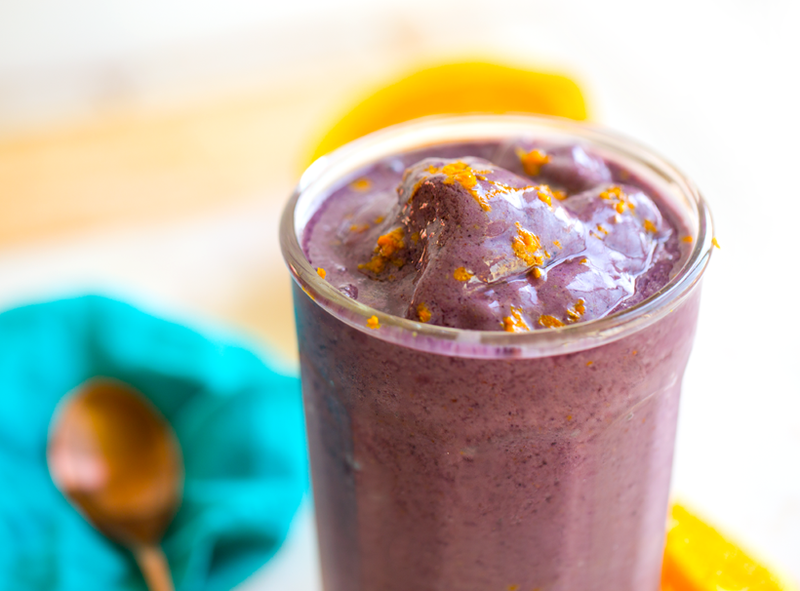 This creamy sweet vegan smoothie contains flavors from strawberry, banana, blueberry and the secret boost ingredient is a generous dose of orange citrus zest. Bright and berry summer drink! Add all ingredients to a high speed blender and blend from low to high until smooth.